This is such an easy recipe! now I know a lot of you say you don’t have time for this…but really it can’t be easier and it is less expensive. I like homemade coconut milk to drink, to use in recipes, and smoothies.. but if I want the full coconut cream I will go ahead and use this canned coconut milk brand-it is BPA free. I like using both, but i have to say that it is nice to stretch what you are getting with you money- I often combine them which i then use to make coconut milk yogurt and coconut milk ice cream (family’s favorite food right now!). Another plus is that you get coconut “fluff” as I call it. I use it in place of coconut flour, or at least part. It is lighter and gives you baked goods that nice coconut taste, without being too dense from the actual coconut flour. I will have to post a recipe some time soon because i am experimenting a lot with it right now. So here is the coconut milk homemade and easy of course 🙂 Doesn’t it look nice and smooth..mmm so light and a little sweet too from the coconut. I have two ways, one take about 15 min total (quick) and the traditional way takes more life 40 min total- but i do other things while i wait for the flavors to infuse the water. I usually forget about it honestly, but it will be ok for a few hours on the counter. 1. Boil water-let cool slightly (I love my Medelco 12-Cup Glass Stovetop Whistling Kettle ) 1. Boil water-let cool slightly (I love my Medelco 12-Cup Glass Stovetop Whistling Kettle ) 2. Put your flakes in a glass jar. 2. Put your flakes in a glass jar. 3. Measure your 4 cups of water. 3. Measure your 4 cups of water. 4. Pour your water over the flakes. 4. Pour your water over the flakes. 5.Let sit for 30 min in a quart jar. 5.Let sit for 30 min in a quart jar. 6. Pour the coconut water in the blender. 7. Blend! 6. Pour the coconut water in the blender. 7. Blend! 8.Set up the nut milk bag in a bowl. 1. Pour coconut flakes and water in a pan. 2. Boil water and coconut flakes for 10 min. 3. Let the water cool down a little so it does not burn you. 4. Pour the coconut water in the blender. 6. 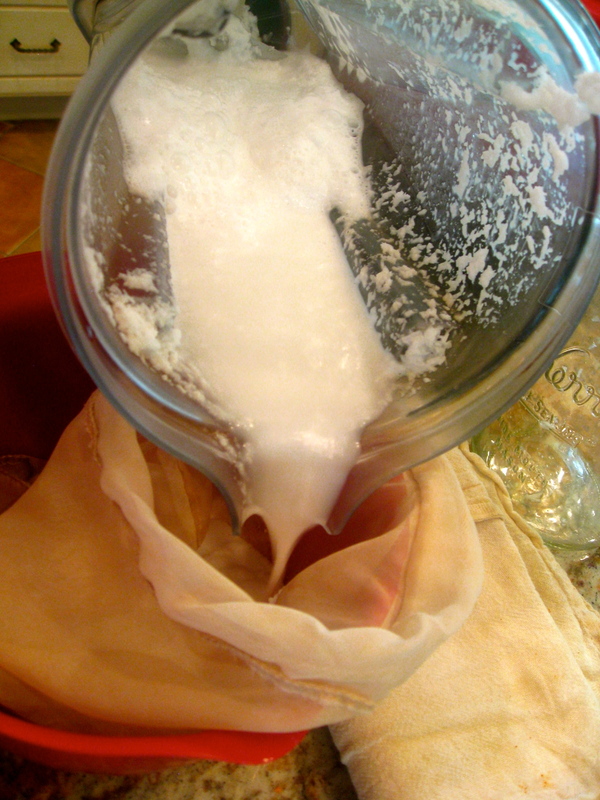 Strain through cheesecloth/muslin/or nut milk bag. 7. Stir in honey/stevia/and vanilla. 8. 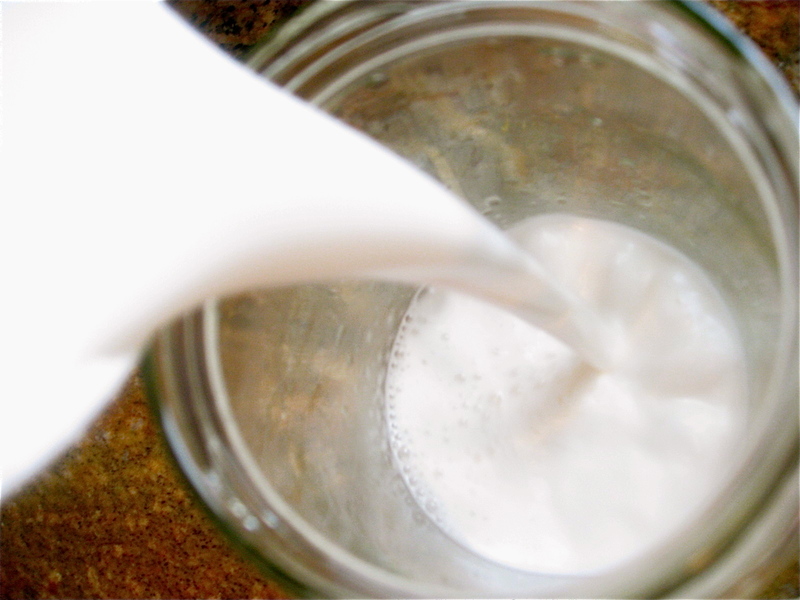 Take out pulp from nut milk bag/cheesecloth save in a container/jar. Love the step by step photos! Thanks for sharing it with us at Scratch Cookin’ Tuesday! I love sharing with your blog link up! I am so excited for you! The GAPS diet is very rewarding, keep it up. I am so glad that you can make coconut milk now easily. Yes i have cracked open several coconuts and it is not fun! You make it look so easy! Does it separate into cream? I can’t get coconut milk in cans without the gums and really want to try coconut cream. Caroline…can you tolerate their coconut milk or cream? I don’t drink coconut milk yet. I can only have coconut oil, but my family seems to do fine with the canned and homemade kind! Wait do you boil the 4 cups of water then pour it over the coconut and then blend it? Or is it 4 cups of regular water with the coconut and then the boiled water elsewhere….? You can do either way. 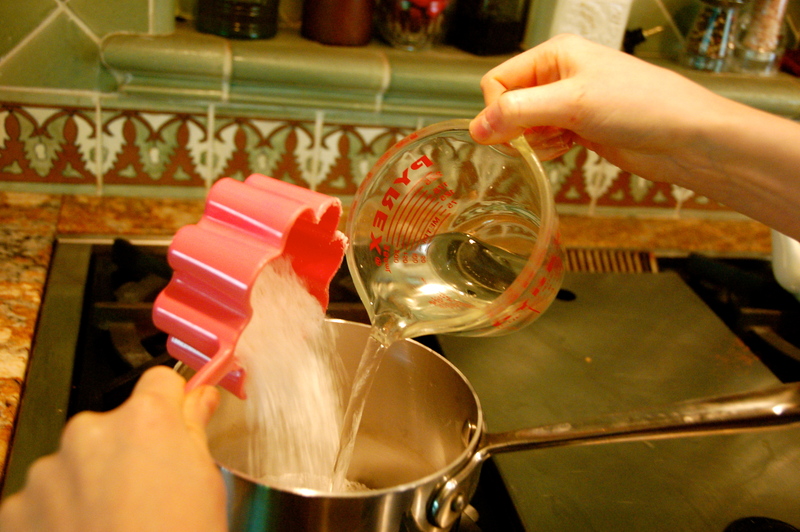 For the traditional way boil water and pour over flakes and let it steep and then blend. For a quick way boil the coconut flakes and water together and then blend. Excellent I just made it and it is perfect! Just one question: I left it on my counter for a few minutes and it started separating like whey from yogurt….is this normal? I have tried this before and it turns out grainy even after straining it. Is this how yours is?? Oh mine in not grainy at all.. hmm did you try my recipe? This looks great. Would you mind posting this to my food blog carnival , superfood sundays? The website is designed to help pregnant women prepare for their newest little arrival. sure I would! thanks for the invitation. Thanks so much for detailed instructions! oh yeah, I’m glad they helped! Maybe you’re already planning on including this in your post about how to use coconut fluff, but I just wanted to mention that I turn my “coconut fluff” into coconut flour. I bake it on a cookie sheet at 200 F for over an hour (until dry) and then grind it! Yes Rachel! So cool. I just use mine wet, but i might dehydrate it like yours sometime too! Also, how long do you blend it? Thanks! Yeah that is what i do too, or i just leave it by the crock pot for a few minutes and give it a shake. Hi there! I have thoroughly enjoyed your blog and recipes as it applies to my family quite well right now. And thank you for the coconut milk recipe! Did you discover or create any recipes that use the “fluff”? I’m thinking it would work well with a coconut crust or almond joy type of thing. not yet–i still plan on it though. dehydrate it to use like coconut flour or just reduce liquid in the recipe if you dont dry it. experiment!